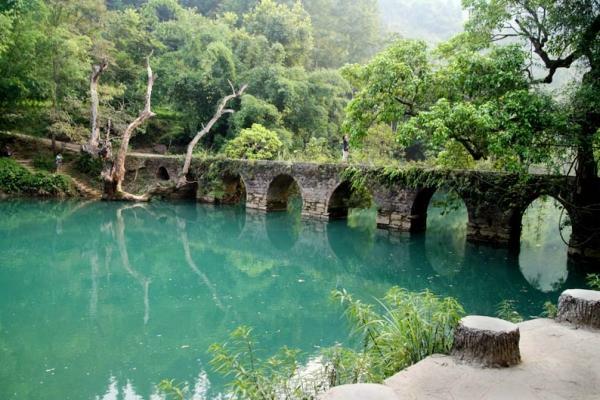 As the first world natural heritage in Guizhou, Libo Scenic Area features a variety of karst landscapes, unique waterscape of Zhangjiang River, luxuriant and densely original forests, and rare species of flora and fauna. It is an integration of one-of-a-kind natural landscapes with local national characteristics such as the Buyi, Shui, and Yao ethnic minorities. Libo Scenic Area features the unique karst landscape, offering Libo Xiaoqikong Scenic Area (荔波小七孔风景区), Libo Daqikong Scenic Area (荔波大七孔风景区), Libo Shuichun River Scenic Area (荔波水春河风景区), Zhang River Scenery Belt(樟江风光带), Libo Maolan Karst Primitive Forest Reserve (荔波茂兰喀斯特原始森林保护区), and Guanyin Peak Recreation Area (观音峰休闲度假区). The area is home to dense native vegetation and rare wildlife. Visitors will be amazed at its unique natural beauty. In In-the-Water Forest, old trees have grown firmly in the water of a valley for hundreds of years. There is a karst forest in a funnel shape where several caves with stalagmites, stalactites, stone flowers, and stone forests are located in. Originally built in 1835, the Small Seven Holes Bridge is covered with vines and ferns with old trees on either side. 68 waterfalls spread over the narrow valley only with a length of 1.6 kilometer. It’s fairly rare around China. In Drunken Forest, trees are covered with vines so that it is difficult to tell what part is the tree and what part is the vine. In addition, Libo Scenic Area offers valleys, underground rivers, a waterfall in a cave called “Yaofeng Cave” and a natural karst bridge. A variety of fishes live in the Yaofeng Cave. Thousands of swallows live in the Ten-Thousand Birds Cave in the Shuichun River Scenic Area. Every early morning, these swallows spend more than 1 hour flying out of the cave. The best time to visit Libo Scenic Area is from April to August. During this period of time, Libo Scenic Area offers the most breathtaking views than any other time. In addition, the water current is big enough to enjoy drifting on Shuichun River. The transportation network is getting better and better in Libo County. There are highways extended to Libo Scenic Area. Therefore, there are a few options.Rent a vehicle from Guiyang or Libo County. This is the quickest and most direct option. Take a direct bus from Guiyang, Nanning, Liuzhou, Kaili, Chongqing, Guangzhou and Duyun to Libo County. Then, take a local bus or rent a taxi to Libo Scenic Area. It is recommended that you visit the In-the-Water Forest in summer. If interested, please remember to take a pair of sandal with you. It is recommended that you spend around 5 - 6 hours visiting Xiaoqikong Scenic Area and 2 - 3 hours visiting Daqikong Scenic Area. Generally speaking, Shuichun River drifting takes around 2 - 3 hours to enjoy. Please take a raincoat or an umbrella with you and wear the sunscreen cream in summer. Interested in visiting Libo on a Tour? Wendy Wei Tours offers a variety of different packaged tours as well as custom tours including Libo, among other attractions and destinations. To find out more, please visit our Tours page or Contact Us directly to find out more.